91 mins. Rated PG-13 for intense perilous sequences, some disturbing images and brief strong language. 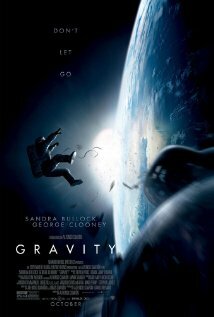 Gravity’s trailer won me over because it did something that too many trailers to wrong. It teased plot, but didn’t give it all away. There has been a recent trend in trailers which have been very good at not spoilering the whole freaking movie. Frozen and Monster University have actually been like short films teasing the tone of the movie while not ruining the experience, while Star Wars-Episode VII: The Force Awakens gives us just moments to titillate us, and it worked. Gravity’s trailer just touches on the first ten minutes. That’s it. A tease. 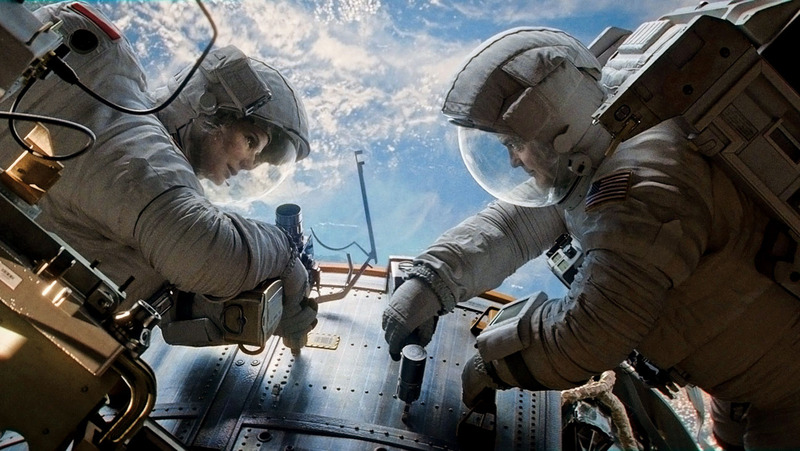 Ryan Stone (Sandra Bullock, The Proposal, The Heat) and Matt Kowalski (George Clooney, Ocean’s Eleven, The Monuments Men) are astronauts on a mission to fix and update some parts on the Hubble Telescope. While on a spacewalk, their shuttle is hit by debris from a chain reaction satellite explosion, causing them to be stranded out in space. Now, they must find a way to get back to Earth with no shuttle in the new film from Alfonso Cuaron (Children of Men, Harry Potter and the Prisoner of Azkaban). I may not like Sandra Bullock, but this is easily her best performance in years. She just knocks in out of the park. George Clooney provides some terrific work in a supporting role as Matt. He has the confidence of a man on his last mission. Cuaron had to develop new filmmaking techniques to handle the cinematography of weightless space and increase the capabilities of an all-CGI film. It took at least four years to get there, but it was worth it, and we all knew it was taking those technical awards at the Oscars. Here’s a tip: if your film has to invent new processes and equipment, you will win Oscars. It just happens. The film is edited to together to keep movie and it features some really long sequences to keep the audience involved in the movie. It certainly works, because it literally left me shaking. I wish I could’ve paused it so I could leave for a few minutes to calm back down. Innovative lighting techniques also create an involved experience. The sound, or lack thereof, and the minimal use of music really assist in making the film real, and few space films utilize the silence of space so well. Gravity is everything I wanted it to be. This uplifting space adventure kept me on the edge of my seat that I was fearful I would fall out of it. If this film doesn’t leave you breathless, you don’t have lungs.